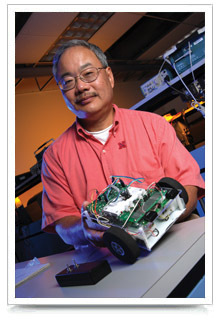 Dr. Bing Chen displays a TekBot. The five-year grant for the Silicon Prairie Initiative on Robotics in Information Technology Phase 2, or SPIRIT 2.0, builds on an existing NSF-funded program developed by a UNL Computer and Electronics Engineering Department team at Omaha's Peter Kiewit Institute. SPIRIT is the brainchild of Bing Chen, chair of computer and electronics engineering, who is leading development of this robotics-based curriculum to help teach math, science and technology to the nation's school children. Since the original NSF-funded SPIRIT program began in 2006, UNL engineers at PKI and University of Nebraska at Omaha education faculty have partnered with Omaha Public Schools to launch a program in Omaha middle schools. The UNL-UNO team trained math and science teachers in fifth through eighth grades to build small robots, called TekBots, and then worked with them to develop lessons using TekBots in their classrooms. "We're taking advantage of 100 teachers who have attended our TekBot workshops to assist us in designing a curriculum that can be distributed on a national basis," Chen said. Providing expertise in curriculum design and evaluation on the project are Neal Grandgenett and Elliott Ostler of UNO's College of Education and faculty from UNL's College of Education and Human Sciences and Iowa State University. SPIRIT 2.0 will use the Internet to distribute a flexible series of lessons and technical materials to teachers nationwide. Once trained, they can then use TekBots to create hands-on, interactive lessons that illustrate concepts such as algebraic equations, friction, wireless and computer processing, and electronics. Teachers must be trained to build and use TekBots, which are raw circuitry and wires on wheels that were invented at Oregon State University. The initial national workshop for teacher training will be in Omaha, but a distance-learning program will be developed to allow more teachers to participate. The team will create an online community where teachers can ask questions and share their own TekBot experiences as well as online diagnostics to help teachers repair a TekBot by plugging it into a computer to link it back to PKI. Students, Chen said, "don't always see the payoff to what they're studying." He thinks that's one reason fewer American students are choosing math and science careers. He designed SPIRIT to introduce young people to math and science at an early age and perhaps encourage more of them, particularly underrepresented women and minorities, to choose science and engineering careers. "First, you have to empower the teachers," Chen said. Omaha area teachers and their students have responded enthusiastically to the original SPIRIT program and other Nebraska school districts have also participated. The new grant will enable Chen's team to make this interactive and flexible robotics curriculum available nationwide. Unlike other robotic systems, TekBots can be adapted to many uses. "It's essentially one platform flexible enough to meet diverse needs," from urban and rural environments to in-school or after-school programs, Chen said. "The lesson models we're developing not only fulfill the needs of grades 5 though 8, but also take into account the background and interests of the teachers." Teachers can stick to the curricula available online or turn a TekBot into a high-tech gadget by adding components such as video cameras, lasers or remote control circuitry. "We don't have restrictions on the creativity of the students or the teachers," Chen said. "I expect that in five years we will be truly surprised by the direction some of these teachers go with their students." UNL officials said the successful partnership between UNL, PKI and the Omaha Public Schools has laid a strong foundation. They are excited about using Internet and Web technologies to make these innovative Nebraska-developed learning tools easily accessible to schools nationwide. "This project helps UNL contribute to efforts to increase America's talent pool by improving K-12 science and math education," said Harvey Perlman, UNL chancellor. "Recent national reports suggest that to remain competitive as a nation, we must build on our idea-based economy and promote research. A key strategy is to encourage more young people to pursue interests in science, technology, engineering and math. By building on partnerships with colleagues at UNO and the Omaha Public Schools, this project fulfills that goal." Prem Paul, UNL vice chancellor for research, said the SPIRIT project "is a prime example of the great things that happen when we collaborate. Thanks to Bing Chen's vision and leadership and building this strong collaboration, we are now positioned to share these innovative learning tools with students in schools nationwide." David Allen, dean of UNL's College of Engineering, said he expects Nebraska to benefit from this collaboration for years to come. "Bing Chen is pioneering a growing partnership between the UNL College of Engineering and the K-12 teaching community in Nebraska. His work promises to have a major impact on the future of education in the technical disciplines in our state. As teachers learn more about what we have to offer, they will in turn pass that knowledge on to future college students, ensuring a bright future for the technological base in Nebraska."